Fatigue properties of materials are often described using the fatigue limit or the S-N curve (fatigue curve, Wöhler curve). The S-N curve describes the relation between cyclic stress amplitude and number of cycles to failure. The figure below shows a typical S-N curve. On the horizontal axis the number of cycles to failure is given on logarithmic scale. On the vertical axis (either linear or logarithmic) the stress amplitude (sometimes the maximum stress) of the cycle is given. S-N curves are derived from fatigue tests. Tests are performed by applying a cyclic stress with constant amplitude (CA) on specimens until failure of the specimen. In some cases the test is stopped after a very large number of cycles (N>10^6). The results is then interpreted as infinite life. Fatigue curves are often given for Kt=1 (unnotched specimens). Those curves describe the fatigue properties of a material. Actual structures are better described with S-N curves for Kt>1 (notched specimens). The S-N curve above has some characteristic features which are discussed below. Fatigue Limit: For some materials (steel and titanium) there is a stress level (lower asymptote in the S-N curve) below which the material will not fail. This stress level is known as the fatigue limit, endurance limit or fatigue strength. For materials like aluminium, magnesium, austenitic steel, etc. the fatigue limit is not very distinct. The level of the fatigue limit depends on many factors, such as geometry (stress concentration factor Kt), mean stress (stress ratio), surface conditions, corrosion, temperature, and residual stresses. High Cycle Fatigue (HCF): In this region the material behaviour is fully elastic. On log-log scale the S-N curve can be considered to be linear. Low Cycle Fatigue (LCF): If the maximum stress level in a cycle is exceeding the yield strength, the material behaviour in the net section will be predominantly plastic. 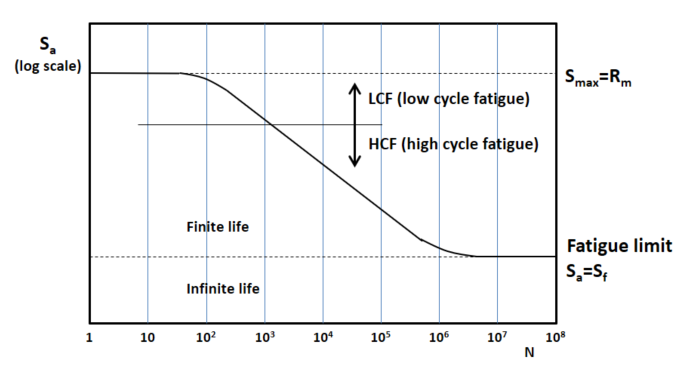 Number of cycles to failure will be very small, hence the term LCF. 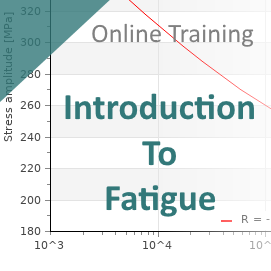 Usually a strain-life curve instead of the S-N curve is used to described fatigue behaviour. Note that the actual distinction between HCF and LCF is not defined by a certain number of cycles but by the amount of plasticity in the net section, i.e. the stress level. Want to know more about fatigue? Get the monthly newsletter with our fatigue blog and information about our services and courses in your mail box. Copyright © 2019 Fatec Engineering. All Rights Reserved.